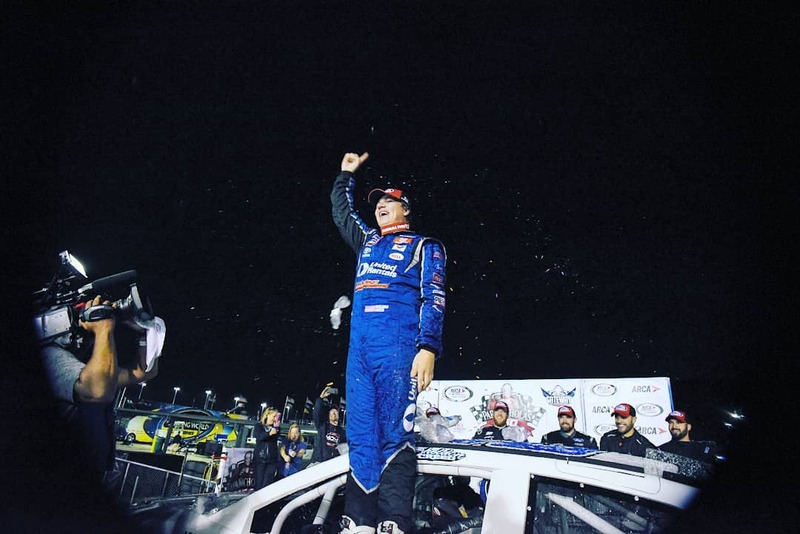 MADISON, Ill., June 26, 2018 (Newswire.com) – Sheldon Creed picked up his second ARCA Series win of the season, leading an MDM Motorsports podium sweep in the Papa Nicholas Coffee 150 Friday night at Gateway Motorsports Park in Madison, Illinois. Creed picked up the win, Chase Purdy finished second, and Harrison Burton came across in third to complete the 1-2-3 finish for MDM. Anthony Alfredo finished seventh in his first ARCA Series start, and Zane Smith was running strong until a crash relegated him to a sixteenth place finish. If the day were a motorsports test, Creed, and the United Rentals, A.M Ortega, RTL Toyota No. 28 led by crew chief Jeff Stankiewicz surely would have aced it. They were fastest in practice, set fast time, led the most laps and won the race. Purdy brought his Bama Buggies, Polaris Toyota No. 8 home in second after starting in the sixth position. He was inside the top five for virtually the entire race, inching closer to his first series win. Burton qualified second fastest in his Dex Imaging, Safelite, Mobile 1 No. 12 Toyota. He ran in the top five throughout the race, struggling on some of the restarts. He finished third and felt like more might have been possible. Alfredo slid over from the NASCAR K&N Pro East Series, where he’s already gotten a win in his rookie season in his CECO Building Systems, Oxford Energy, Meccanic Toyota No. 40. He started 13th, raced inside the top ten all night and avoided costly mistakes to finish seventh. Smith qualified fifth with his La Paz Margarita Mix, Icon Vehicle Dynamics, Speed Vegas Motorsports Toyota No. 41 led by crew chief Mardy Lindley. He had one of the fastest cars in the first 50 laps of the event, running as high as second at lap 44. About thirty laps later, he got loose coming out of turn two and hit the wall. The right front brake was broken from the crash, so he was only able to continue at reduced speed and finished 16th. The Huntington, California driver was disappointed but optimistic after the race was over. Creed now leads Smith by 155 points in the series championship standings. The next race for the team will be this Thursday night at Chicagoland Speedway in Joliet, Illinois. The Scott 150 gets underway at 8 pm Central time and will be televised on Fox Sports 1.